Mello is an elegant cotton fabric with a pleasant softness and cool tactile qualities. Thanks to a thicker melange yarn of recycled cotton, the robust twill weave has a lively yet balanced appearance. The understated colour palette for Mello ranges from pastel tones to natural, earthy shades and darker hues. Mello is available in 12 colours. The woolen textile Aura has a classic satin (atlas) weave with a fine, soft surface. This fabric is distinguished by a supremely soft feel, lustrous sheen and smooth even surface. The solid and mixed colours feature dynamic, highly saturated tones made possible by wool’s excellent dyeability. Aura is available in 26 colours. Maize is a heavy-weight woolen textile. Slub and worsted yarns with an irregular balance between warp and weft create a natural handwoven character. The high-contrast duotone shades define the visual appearance of Maize and give the fabric its lively depth. Maize is available in 19 colours. The Soft Modular Sofa is Jasper Morrison's current interpretation of what has become a modern classic: the low-slung modular sofa with a decidedly horizontal emphasis. Uniting carefully composed proportions, great comfort and a conscious renunciation of decorative details, the Soft Modular Sofa exemplifies the characteristics of this sofa type in their purest form. Firmly in line with his philosophy of 'super normal' design, Jasper Morrison has successfully coupled home-like informality with precise finishing and expressive clarity. 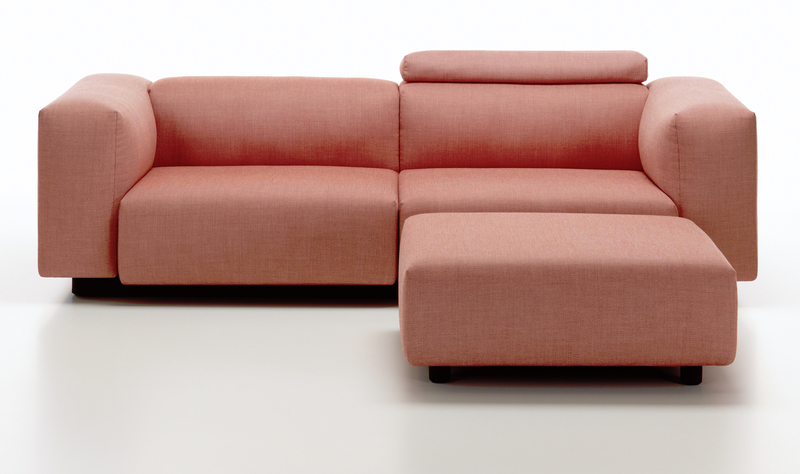 As a result, the Soft Modular Sofa functions like an architectural element that can be subtly integrated in any interior. 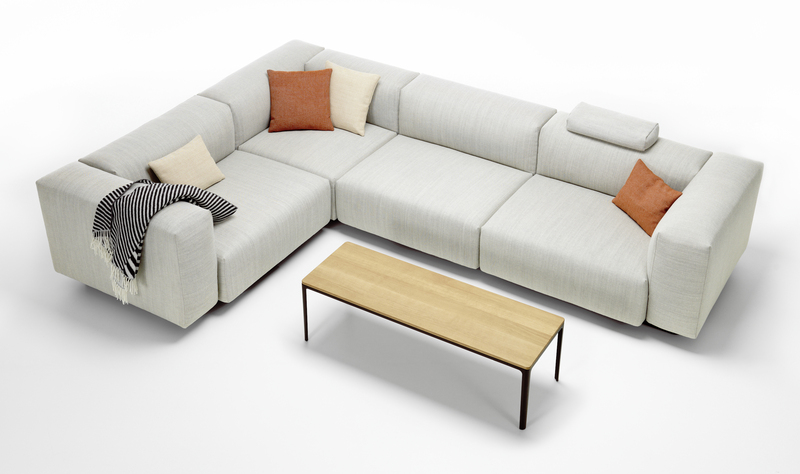 The voluminous cushions invite the sitter to lounge and relax on the Soft Modular Sofa. Its high-quality interior construction, consisting of various foams and a spring core, offers superb comfort and ensures that the cushions return to their original form after use. On one hand, the black base frame is part of the functional design, enabling a practical and stable connection of the modules. On the other, as a plinth-like platform with rounded corners, it references the sensual elegance of art deco. 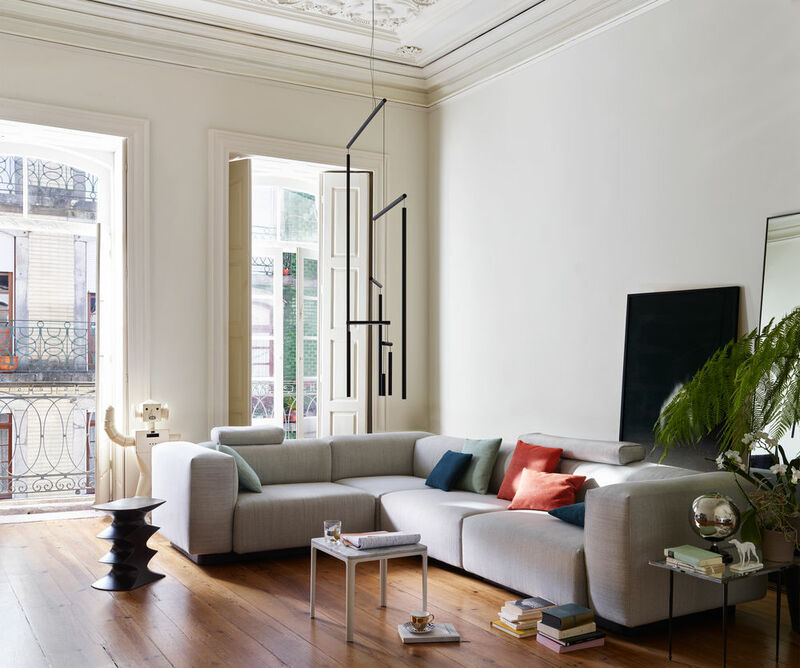 Thanks to its modular design with side, corner and central elements as well as a chaise longue, the size and form of the Soft Modular Sofa can be customised to meet a diverse range of requirements. And with optional elements like the ottoman and additional cushions as well as the wide selection of leather and fabric covers in a variety of colours, each desired configuration can be even further individualised. Different cushions are available as an option: neck cushions (filled with plastic beads) or decorative cushions (with PU chips and PU beads). The neck cushions are available in short or long variants and the decorative cushions come in three sizes: 30x40cm, 40x40cm and 50x50cm. Maize fabric, colour brick / beige. The construction of the Soft Modular Sofa provides outstanding comfort: the underlying foundation is a box-like wooden frame, which rests on individually height-adjustable legs concealed by the black base frame. No-sag springs (steel springs) are integrated in the wooden frame in the seat area. These ensure that the cushions return to their original shape after use and prevent ripples from forming in the cover material. 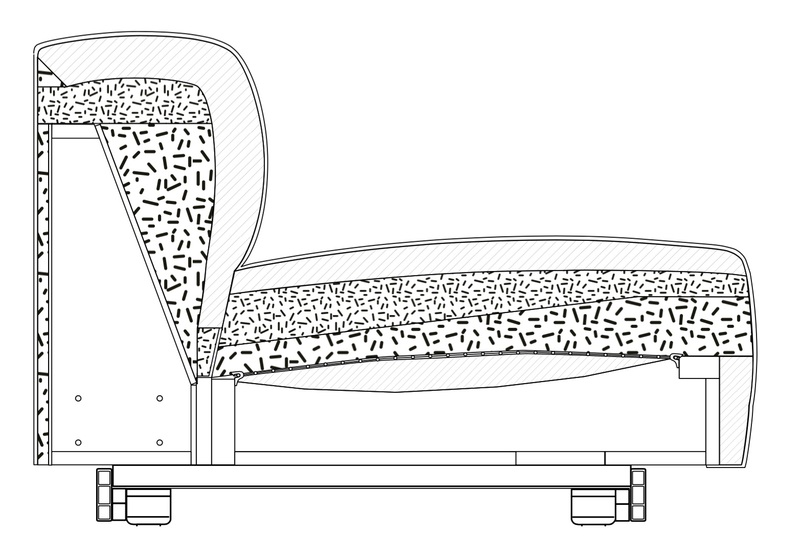 The seat and back cushions consist of two optimally coordinated types of foam with varying degrees of firmness. The upholstery construction is completed with a layer of viscoelastic foam, which keeps the sitter from sinking too deeply into the seat. All these elements are carefully balanced in a way that enables the Soft Modular Sofa to be offered in only one upholstery version while still satisfying the comfort needs of almost all customers. Fabric and leather covers have the same underlying upholstery. No animal feathers are utilised in the upholstery. This avoids the typical rustling associated with such materials and also makes the Soft Modular Sofa suitable for people who are allergic to animal feathers. Seat steel frame, wood construction with steel springs, polyurethane foam structure and visco cover. Back wood construction with polyurethane foam structure and chamber cushion overlay. Arms Available in 2 heights. Wood construction with polyurethane foam structure and chamber cushion overlay. Covers fabric covers are removable; leather covers cannot be removed. Glides plastic glides with levelling adjustment. Ottoman structure wood construction, steel springs and polyurethane foam structure with visco cover.